Community meals are really important to us. Sharing fellowship and a meal with friends is one of our favorite things to do. Free conversation flows over a good meal and friendships grow deeper and connects made over food and drink! In the past few years Brian and I have had many people over to share a meal, or dessert, sometimes just coffee or an afternoon of games. Special memories have been made and strong bonds formed. Pre kids and with very young kids we had a dinner group with three other couples. We would each take turns hosting each month. It was a really special time with friends and through it we formed lasting and deep friendships. Unfortunately it had to come to an end when we went from 3 kids in the group to 7 kiddos in one year! We ended up managing kids more than sitting around a table enjoying a meal together. Our lives changed and it wasn’t as feasible. Maybe one day we can pick it up again! Also, two of the couples have since moved out of state, but we still keep up as best we can! All this to say we LOVE food, especially when shared with friends! 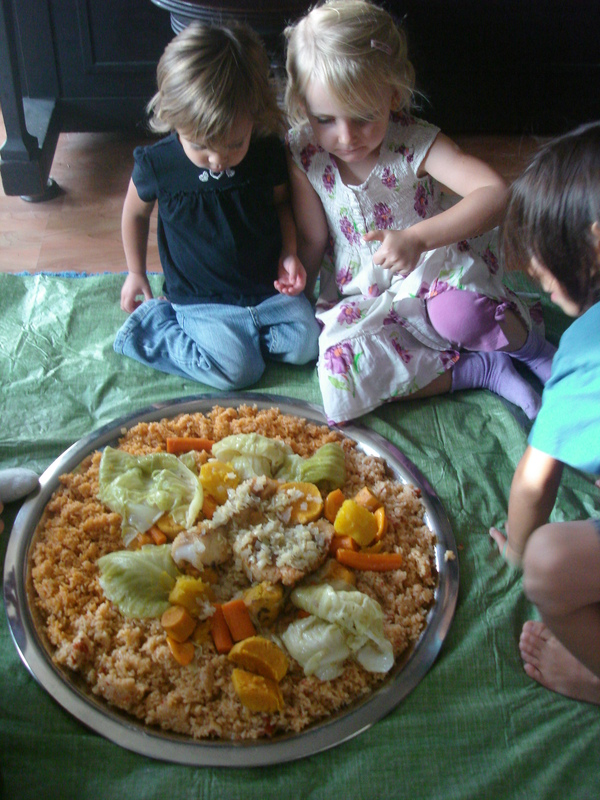 This dish is a true communal food! We were introduced to Mafe (Mah-Fae) from dear friends serving on the mission field in west Africa. 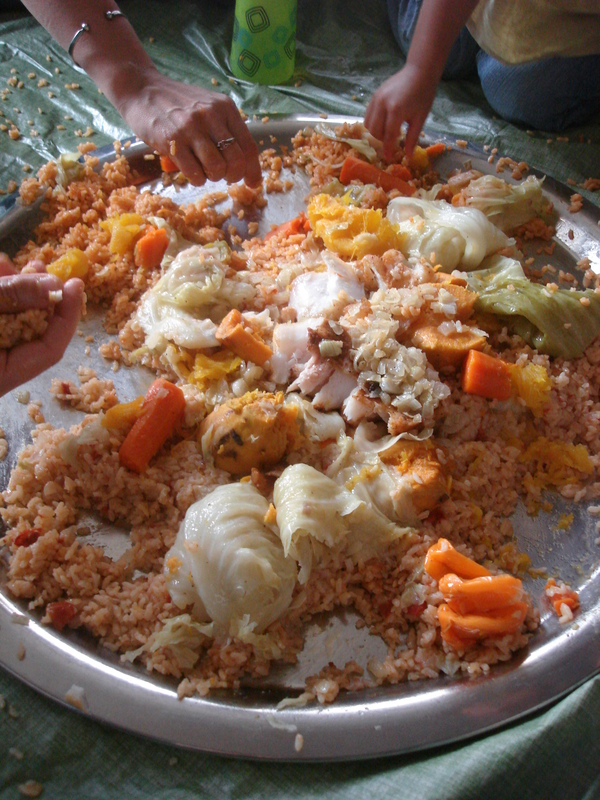 This is a common dish that is served to family and friends over rice in one large communal dish. They would all sit on mats around it on the floor. Each person eats what is in front of them and if the host thinks certain guests should get more veggies, or meat (which is the esteemed portion) he or she will re-proportion choice pieces. We’ve had a few friends to share this meal with, but they kinda gotta be on board with the idea before planning on serving it! Quite a few typical Americans wouldn’t usually enjoy this type of eating! We’ve also had it for dinner just as a family which is a great way to start! This is also a great meal that can be stretched to use a smaller portion of meat to feed quite a few people. You can also clean out your fridge and mix in any veggie that sounds good! Here is a loose rendition of our favorite mixture or a good variety to start with, but feel free to add and change it as you like! Mix all the above ingredients together except for the peanut butter and put into large stew pot or crock pot. I prefer to cook it in the crock pot on low for about 6 hours. Add the peanut butter at the end and serve over rice! Give it a try and let me know what you think! I’ve also done this with almond butter instead of peanut butter. It can also be served over cauli-rice or spaghetti squash instead of rice. Would love to get some feedback! Do you have a favorite ethnic dish? I LOVE this stuff Bethanie! Although, I probably will have to get with you on presentation! This looks WAY better than when I make it! HEHEHEHE!